Many have heard of Hanton City; Smithfield’s infamous ghost town dating to the 17th century, but how many know it isn’t the only “lost” settlement of our town? There was another village, one that may have pre-dated the Hanton settlement by about fifteen years, and it existed for more than two centuries before it disappeared. Yet unlike Hanton City, this one prospered with industry and fortunes were made. It was known by different names; Ripper’s Brook, Reaper’s Brook, and Fountain Spring, but the most colorful was “Skeeterville”. 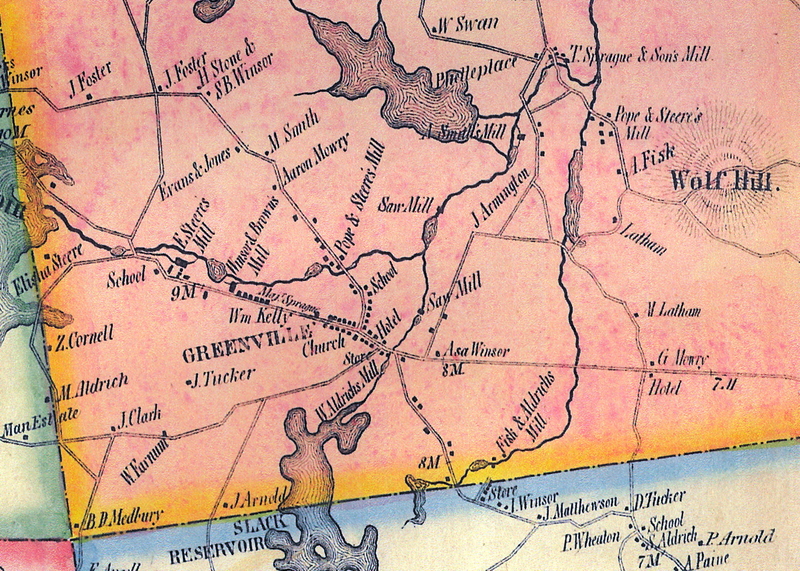 Skeetersville’s origin dates to a town meeting held in Providence on July 3, 1663, when present-day Smithfield was still considered the “outlands” of the Providence settlement. 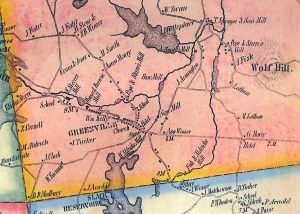 At that meeting William Hawkins was granted fifty acres of land that today is located between the Lark Industrial Park off Route 44, and Greenville Avenue near the Smithfield/Johnston line. The grant came with the stipulation that Hawkins improve the land and live on it for a period of at least three years. Furthermore, the property couldn’t be sold without the consent of Providence town officials. The Rhode Island colony was less than thirty years old at this time and it was understood that for the state to thrive some had to be willing to leave so-called civilization to populate the “outlands”. Offers of free land created incentive, for land afforded one wealth and opportunity. Being the first to settle in what was then a forested wilderness was not without its trials and dangers. Clearing the land and building a shelter had to be done with hand tools such as a broad axe and saw. One would need to hunt or grow their own food, maintain a constant supply of firewood, and contend with wild animals that roamed Rhode Island at the time such as bears and wolves. Being far from the protection of the Providence settlement also meant one was left to their own “doctoring” if they became sick or injured. Therefore, homesteading was not an agreement to enter into lightly. Hawkins, it can be surmised, was an intrepid man who liked a challenge. His family was part of the original group of settlers who came to Providence with Roger Williams in 1636. Hawkins established his home along a stream known as “Ripper’s Brook” that is listed as “Reapers Brook” on contemporary maps. (The origin of the name is unknown.) The brook begins at Cedar Swamp, on Cedar Swamp Road, and runs south under Route 44, and eventually flows into Factory Pond off Greenville Avenue. From there it empties into Hawkins Pond on the other side of Greenville Avenue. The exact location where Hawkins built his home has been lost to history, but before long other hearty souls followed and settled the area. At this point in American history, wool was a common material used for making cloth and clothing. However, raw wool sheared from barnyard sheep was often clumped with dirt, oils, and other barnyard matter that needed to be removed before spinning. A process called “fulling” removed the impurities. Fulling mills had been around since the medieval period, but not in America. Seizing a business opportunity, about 1699 Hawkins partnered with Daniel Williams to build a fulling mill along the brook. The mill was supervised by a man named Robert Sanders, who later partnered with Moses Bartlet to build a second mill nearby. Much of the clothing worn by the average person in early America was “homespun”, meaning it was manufactured in the home. (Factory-made cloth from England was expensive.) Raw wool or cotton would be spun into yarn on a wooden “spinning wheel”, and then placed in a loom to be woven into cloth. The cloth could then be sewn into clothing. As one can imagine, the process was time consuming even for the simplest garments, which is why fulling and textile mills were much welcomed in their day. 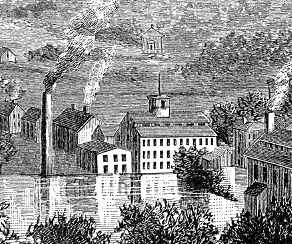 It’s interesting to note that these two mills existed in Smithfield before the so-called “Industrial Revolution”, which began with Samuel Slater erecting his first textile mill in Pawtucket in 1793. By 1800 textile mills were beginning to appear along the Blackstone Valley, and Nehemiah Hawkins, a descendent of William, converted one of the mills to the production of textile machinery to meet growing demand. His business was so successful that he later constructed Skeeterville’s largest building, a three-story factory that according to one report measured 140 feet long and 40 feet wide. 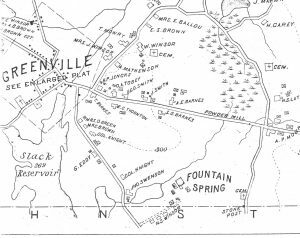 By 1830 some began referring to the settlement as “Skeeterville”, which one may presume was due to a large mosquito population, possibly breeding in the two mill ponds. Whether the name was coined by those living in the area or by outsiders is unknown. In either case, the name stuck, even though in later years the settlement became officially known as Reaper’s Brook, and Fountain Spring. 1851 H. F. Wallings Map – Click to enlarge. An 1851 map of the area produced by H. Wallings indicates the large mill at that time was being operated by the Fisk & Aldrich Company. Wallings produced another map in 1855 showing the same mill, but with the name Reaper’s Brook – not “Rippers Brook” in bold letters to designate the area. An 1871 Beers Atlas map of Smithfield refers to the area as Fountain Spring. The name is said to have come from natural springs located in the area. According to a 1905 Providence Journal article, some of the mill homes had springs in the cellars, and one tenant reportedly kept shiners (bait fish) in his spring to have a ready supply of bait for fishing. Close-up of 1871 Beer’s map. Click to enlarge. In 1892, the three-story mill and surrounding property was purchased by Greenville businessman Nicholas Winsor. 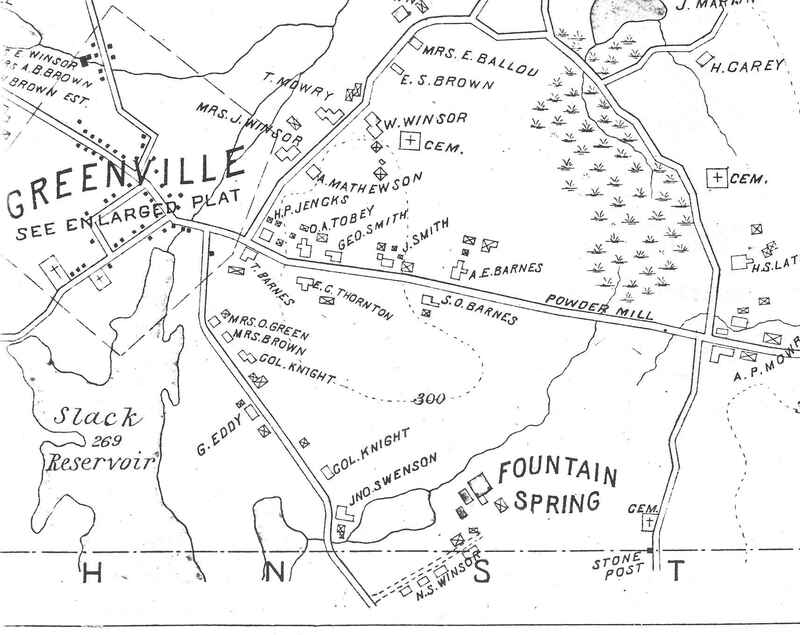 An 1895 map of the area shows a large mill and other buildings were still standing, and while “N.S. Winsor” is listed as the property owner, there is no name associated with the mill indicating it was not in operation at that time. Winsor later sold the property in 1904 to Frederick W. Thrift of Providence, who in turn sold it to Doctor Archibald Hughes of Smithfield in 1921. (Contemporary maps show a Hughes Drive leading in off Greenville Avenue.) Hughes planted numerous apple trees on the property, and used the vacant three-story mill for apple storage. 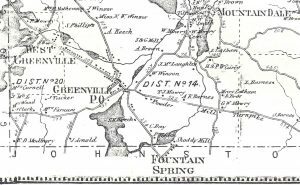 By the 1920s Skeeterville, now Fountain Spring, was nearly two-and-a-half centuries old. The original structures of the 1600s were gone, and most of what remained, including the factory, eventually succumbed to the elements and the wrecking ball. Thus Skeeterville essentially disappeared. 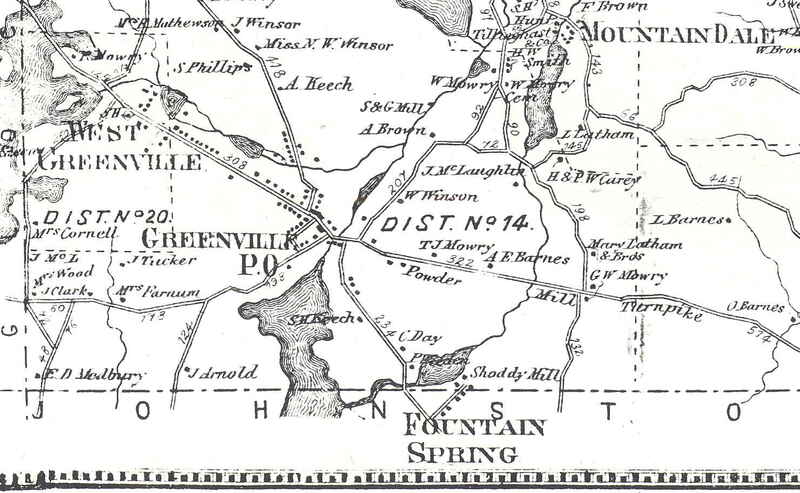 1895 Map of Fountain Spring. Click to enlarge. Evidence of the missing cemetery can be found in a Providence Journal article dated June 2, 1918, one year before Arnold conducted his survey. The article places the cemetery on a “prominence” overlooking a pond, with about twenty-five head and foot stones, with nearly obliterated markings. Only one stone was readable due to it having fallen over face down, with the name “Sanders” on it. Those in modern times who have searched for this cemetery have been unsuccessful. The area that had once been Skeeterville lay more or less undisturbed until the late 20th century when developers began building homes in the area. Today certain streets such as Factory Pond Circle, Reaper Court, and Fountain Spring Lane, reflect the area’s historical heritage. While some of the homes along Hughes Drive date to the 19th century, the site of the large factory is now occupied by modern dwellings. Yet some who live in the area will say that if one knows where to look, traces of Skeeterville can still be seen. Authors note: A special thanks is extended to Mr. Peter DuPont of Greenville for supplying some of the information in this article.